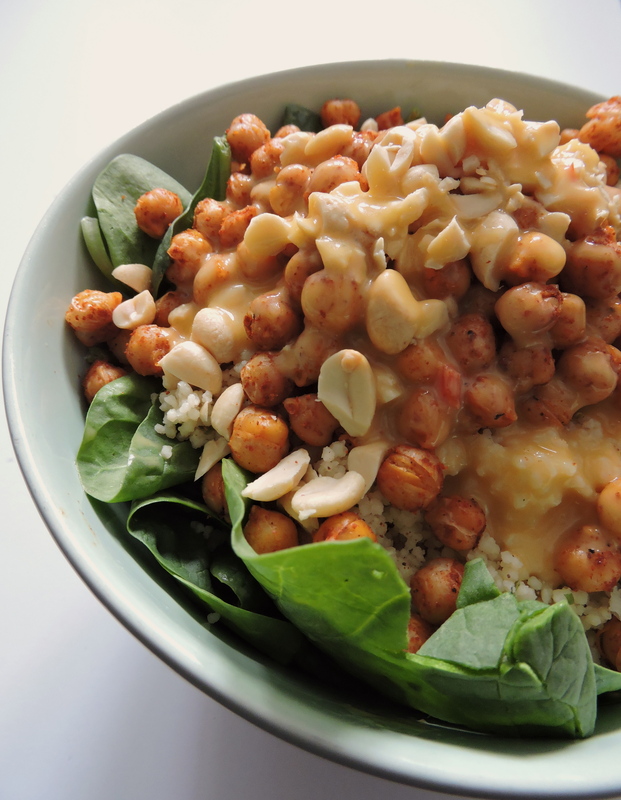 Couscous & Roasted Chickpea Salad: My New Lunchtime Obsession. I am obsessed with a salad. I never thought the day would come that I would say or write those words, but here it is. I’ve never been a salad fan; a big bowl of lettuce has just never seemed appetising to me. The notion that vegans always eat salads was therefore always hilarious to me, because it couldn’t be further away from the truth in my case. But I have finally found a salad that I actually REALLY like. At first, I wasn’t even sure it was a salad, because what really constitutes as a salad? In my book a salad has a lot of leafy greens, veggies and protein, and some other stuff thrown in as well. So in that case, this couscous & chickpea salad fits the criteria. This isn’t exactly a recipe post, because the salad it really easy to throw together and should be personalised to fit your tastes. But I’ll tell you how I made it! Start with a base of greens, I went for spinach. Spinach is my favourite type of leafy green to use in a salad, because it has such a mild taste. I also added in some cucumber for some crunch and freshness. Then for the couscous; make yourself a serving of couscous (follow the instructions on the package, it shouldn’t take longer than 10 minutes to make) and add in any seasoning you like. I added in garlic powder, smoked paprika, pepper and mixed herbs. Flavouring the couscous really helps to make the salad more tasty! The protein in this salad is your roasted chickpeas; I actually have a recipe on these that is super easy to follow. Then for some more protein I added in some chopped peanuts. Any sort of nut or seeds would work well in this. It also adds some healthy fats. Top of the salad with a dressing. I used a store-bought mango & chilli dressing that worked really well with this. Home made dressings would be even better; try out different combos to find your favourite. That’s it! This salad is totally customizable; just find the flavours that you like to make the perfect salad. This salad also works great for meal prep. 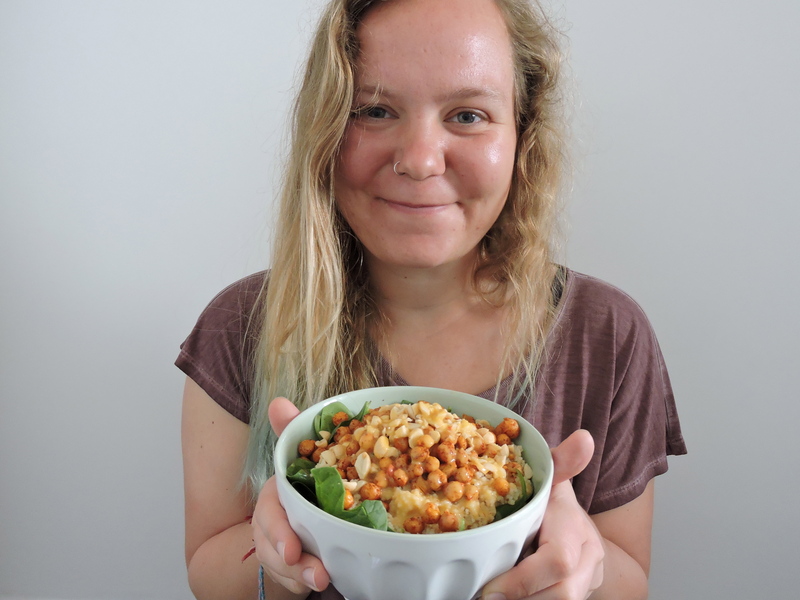 When I prepared it, I made a big batch of couscous and roasted chickpeas in advance, and had the salad throughout the week. So it would be great as a school or work lunch when you don’t want to spend too much time in the morning making your meal. Let me know if you try this out! Trying The Vegan Boxed Cake Mix Hack (Spoiler: It Worked!). My New Snack Obsession: Wild Thing Popcorn Flats.